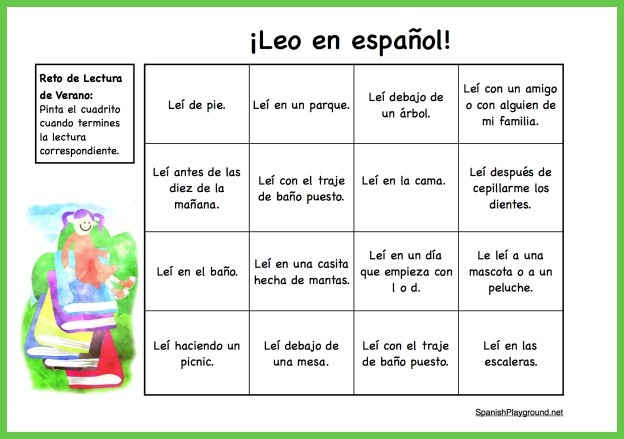 This bingo-card style reading challenge encourages children to read in Spanish. They read at different times during the day and in different places. 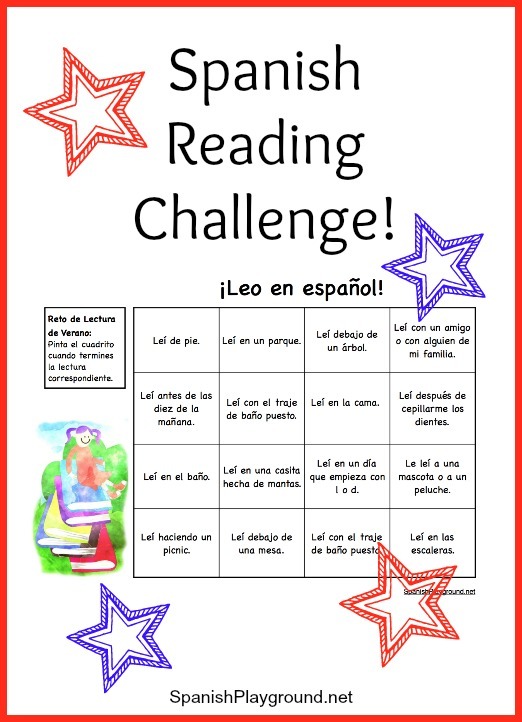 A Spanish reading challenge is one way to add a little more language to your child’s summer! Print a free bingo-style reading card for each child. It describes fun places and ways to read. Kids set a goal using bingo scoring, and read to complete a row, a column, the four corners or black out the card. Children read a book in Spanish, or listen to a read aloud, following the instructions in one of the squares. They color or cross off the square when they finish the book. Children who are reading longer books, can choose a number of minutes or pages to read for each square. Kids might need your help to find books to read in Spanish. We have put together a book list, and you can find many of the titles in libraries or order them online. You can also find reading activities and reviews of books on our reading resources page. If your child is a Spanish learner, be aware that the language in picture books can be difficult, so older children will learn from books for younger kids. Libraries often have translations of easy picture book favorites, such as titles by Eric Carle, Bill Martin Jr. and Sandra Boynton. Kids are familiar with the books, and simple stories reinforce verb forms and agreement. Re-reading is excellent language practice. Reading a favorite book over and over for the Spanish reading challenge is perfectly fine. Download another reading challenge and other fun challenge activities on our Summer Spanish resource page. Have fun with this new reading challenge!